The Rondanini Pietà is Michelangelo’s last work which he was carving for himself. He had modified it several times, and continued working on it right up to his last days. After many vicissitudes, the statue was bought by the city of Milan with funds collected from the public, arriving there in 1954. At the time, the Museum of Ancient Art was being established in the reconstructed Castello Sforzesco, and in the last room of the museum a separate intimate space was created for the sculpture by the architectural firm Studio BBPR. Over sixty years later, the world has since changed and the Museum today has significantly different requirements, particularly due to the increase in numbers and needs of the visiting public. After much discussion, it was decided in 2012 to create a larger space devoted exclusively to the Pietà in the former Spanish Hospital. But moving such an important and fragile work is not easy. Since 1954 the sculpture has rested on a Roman altar, and during our conservation treatment from 2002 to 2004 we never managed to work out exactly how the Pietà was attached to the altar base. Further, the separate arm, left over from an earlier version of the sculpture Michelangelo had abandoned, had been damaged, suffering several cracks, when the sculpture had been moved on previous occasions, and the surface of the statue, covered in Michelangelo’s deep stone carving work, is extremely delicate. However, the problems to be faced were not limited to the practicalities of moving the sculpture to its new home; there were also concerns arising from some features of the space itself: passing under the Spanish Hospital, there are not one but two metro lines. So, to the problems of protecting the surface of the sculpture, lifting it, moving it and setting it up in its new space, there was added the problem of designing a display system that had to completely isolate the work from the vibrations transmitted by the metro trains through the ground and into the building. To this was added another burning issue – the fruit of many tragic events in Italy in the last few decades – how to protect the Pietà from earthquakes. The long process of studying, designing and cross-checking lasted over two years and involved numerous institutions and experts in different fields. Working with these groups was what took up most of our time, caused us most of our worries but also contributed most to our professional growth: each new practical or technical proposal had to be weighed up against the condition of the sculpture and its future well-being, laying down limits and what could and could not be done. We also had to come up with innovative solutions to tricky problems, for example what to do about protecting the marble surface of the sculpture inside the structure – designed and built by Arteria company with the ISCR – which would be used to move the sculpture. 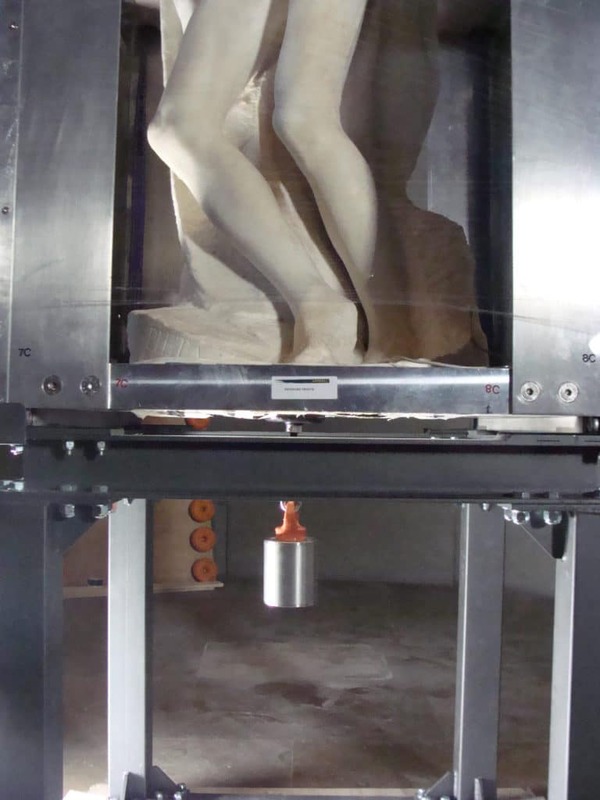 The new system of protection against earthquakes, involving the use of a flexible element connecting the statue to the new base was designed by Myamoto International, verified by Politecnico di Milano, constructed by Kimia and attached to the sculpture by CBC. Ensuring the sculpture was stable in its new base was complicated by the fact that the original base is irregular and the work has an extremely eccentric weight distribution. This required extensive experimentation and much testing, with the final solution drawing both on traditional techniques with innovative materials. The whole arduous and innovative process was rewarded with the ENR Global Best Project Award 2016 for Speciality Construction to Myamoto International, for the team’s “innovative approach” and “great use of technology” in constructing the special combined barrier system for traffic vibration and earthquakes. Since May 2015 the Pietà has been in its new home, in a space designed by Michele de Lucchi and built by Castelli. Since its move, there has been a steady increase in visitor numbers which has also carried over to the other parts of the museum in Castello Sforzesco. The next challenge for us will be to see the Programmed Maintenance Plan approved, to ensure the best conservation for the Rondanini Pietà over time. Soprintendenza Castello Sforzesco, Comune di Milano: Dott. Claudio Salsi, Dott.ssa Giovanna Mori. Politecnico di Milano, Dipartimento di Meccanica: coordination, technical design of the isolating base. Politecnico di Milano, Centro Beni Culturali: maintenance surveillance on the surface of the Pietà. Istituto Superiore per la Conservazione e il Restauro, Roma: supervision of the conservation project and the planned maintenance plan. Wsense, spinoff interdipartimentale Università La Sapienza, Roma: shock and vibration monitoring during handling and transport. Design of the exhibition space, new pedestal and balustrade: aMDL studio. THK, GmbH: implementation and verification of the anti-vibration base. Miyamoto International, Inc.: Technical design and simulation of the operation of the anti-vibration base. Arteria Spa: design and construction of the supporting cage for lifting and moving the sculpture. 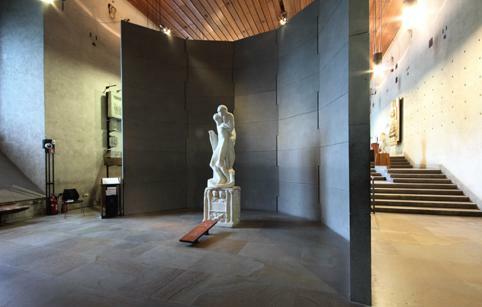 UnoCAD srl, Vicenza: 3D relief of the original sculpture and realization of a 1: 1 scale marble model. CESI spa: anti-vibration base approval testing. Goppion spa: Creating the support structure for the floor, the new pedestal and the balustrade. Kimia spa: anti-seismic cell coupling device and adhesive resins for attaching the device. Artemide spa: planning and installation of lighting. Paolo Castelli spa: furnishings and finishes.